After the sports coupe, Audi TT, the German automaker waited no longer to bring out the new four-ring product, the Audi A4. The longest selling sedan in Audi’s history, and the success run in the previous year, meant that the German automaker had much at stake with the introduction of the new product. And its job well done, with the new product building up in terms of emotional and features over the forerunner. We can tell with certainty that you will like this car as Vorsprung durch Technik brings out the best of the Audi A4. 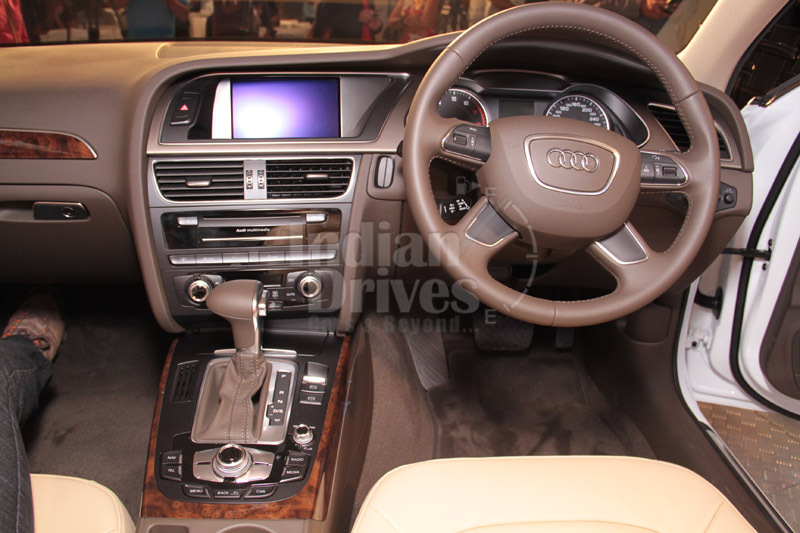 Introduced first time in 1994, this is the ninth generation of A4 sedan offered globally. With the entry level model pegged at Rs 27.33 lacs (ex-showroom Maharashtra), the A4 is the best compromise over the more brutal Mercs and Beemers. On top of the new exterior and interior updates, the more familiar bits on a facelift, the new A4 comes with new S-Line sports package, electromagnetic steering, brake energy restoration system, the more vital stuff that makes driving the new A4 an occasion in itself. 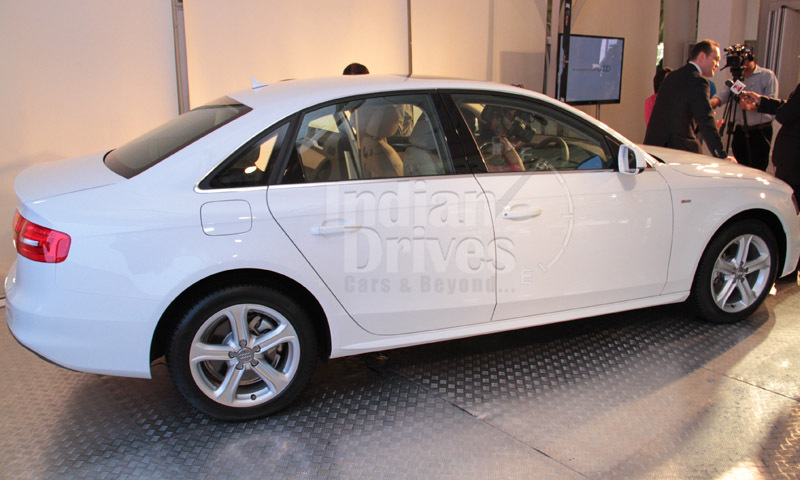 As a part of the 2012 model, Audi featured a more aggressive and beefed up appeal for the new Audi A4. Not only does it get bigger in size, but it grown in terms of charisma. You don’t need to be an Audi enthusiast to insinuate the upgrades in the new model. Nevertheless, it does leave you stunned at the first glance. At the first look, the LED daytime running headlamp is the object that catches the eye. On a closer look, the bumper is restyled with minor changes to the fog lamps, and revised contours that match with the bonnet. 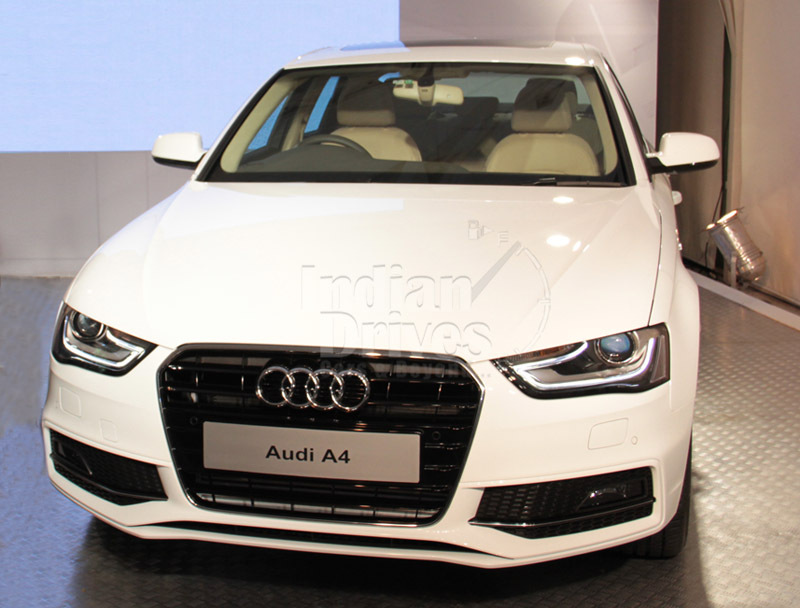 Similar to the new A5, the Audi A4 also gets six-pointed prominent front grille that graces the Audi rings. The sleek and longer headlamp does wonders to the front appearance with the new LED running lamps. Walking toward the side of the car, it has grown significantly in size, with the overall length coming up to 4701 mm. Adding muscle to the A4, the new five-spoke 16-17 inch alloys are marvelously fitted into the wheel arches. 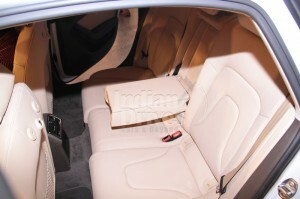 There are some obvious features that are seen on modern cars, like the body colored RVM and door handles. As the overall size of the sedan grows, the taillights also feature a longer and sleeker appeal, while the exhaust tail pipes bank out of the raised rear bumpers. The Panoramic sunroof is another underline of the new A4. Technically speaking, the chassis of the new A4 is more stiff than the outgoing model, making it more forgiving on corners and there is lesser body roll. Though it is not as sporty as the BMW 3 Series, it is a fun machine to drive. To improve the handling characteristics, Audi has retuned the rear trailing link and shock absorbers. Whereas, five link suspension with upper and lower wishbones underpin the front and a tubular anti-roll bar reduces roll on banks. While the outgoing model featured tough German quality and ingenious ergonomics, the new model is more charming and cool. On the inside, the A4 features design and package that will impress any Audi lover. Though the features are not in the likes of the C-Class, it does not have to please a Merc owner. The Audi A4 has a class of its own. The build quality is amazing, it is packed with gadgets, and there is more or less everything that makes the A4 a corporate man’s ride, while still being a very cool car to hang out in. Audi adds elegance to the vehicle by adding chrome bits to several elements. Upfront, there is a restyled central console and 4-spoke multifunctional steering wheel. Entertainment package includes concert radio with eight speakers that comes as standard. The MMI system with voice dialogue, color monitor and DVD player comes as optional in the top-of-the-range model. As a part of the 2012 model, the A4 features Driver Information System, Audi Music Interface with Bluetooth, three-zone climate control and Audi parking system. In terms of ergonomics, the front seats are electronically adjustable with memory functions for the driver’s seat and 7-arm structural design. There is also Walnut brown interior package and seat upholstery in Milano Leather that comes optional in top-line models. For safety, Audi has equipped the new A4 with Anti-theft alarm, anti-theft bolts, front and rear airbags, auto release function. Other safety features include ABS, EBD, ESP and brake assist. The electromagnetic steering does an amazing job with the steering feeling more lively. It can detect the speed of the vehicle and the steering wheel torque and accordingly steer the vehicle into the corner. The A4 is a ton on comfort level and can drive miles without you knowing it, thanks to the improved NVH levels and the Quattro design. Audi offers three power plant options for the new A4 – two diesel and one petrol. 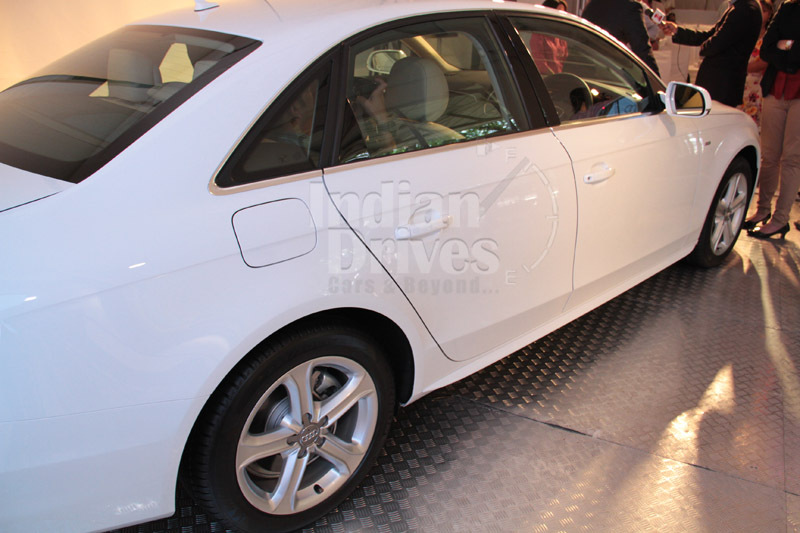 For the petrol variant, there is a 1.8-litre TFSI Quattro engine that is good for 170 bhp and 250 Nm torque. The 1798 cc (precisely) turbocharged engine features inline-four configuration with Double Overhead Cam. 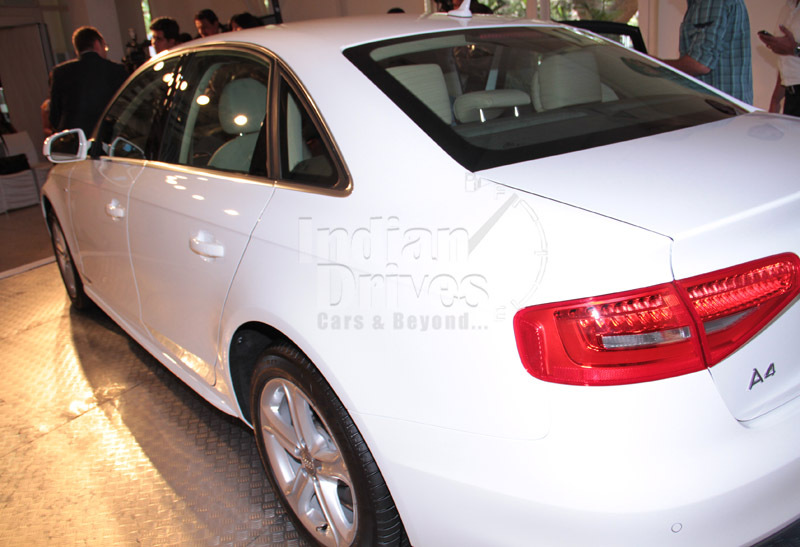 All that torque means the A4 can sprint from 0-100 kmph in 8.3 seconds, which is quite impressive for a four-door sedan. Moreover, it can do speeds up to 225 kmph. For the diesel trim, Audi offers the 2.0-litre TDI engine that churns out 143 bhp peak power and 320 Nm peak torque. The 1968 cc inline-four cylinder engine features direct injection with VTG turbocharger and DOHC configuration. It is 0.8 seconds slower than the petrol version in a 0-100 kmph drag. However, the top speed is still impressive at 210 kmph. 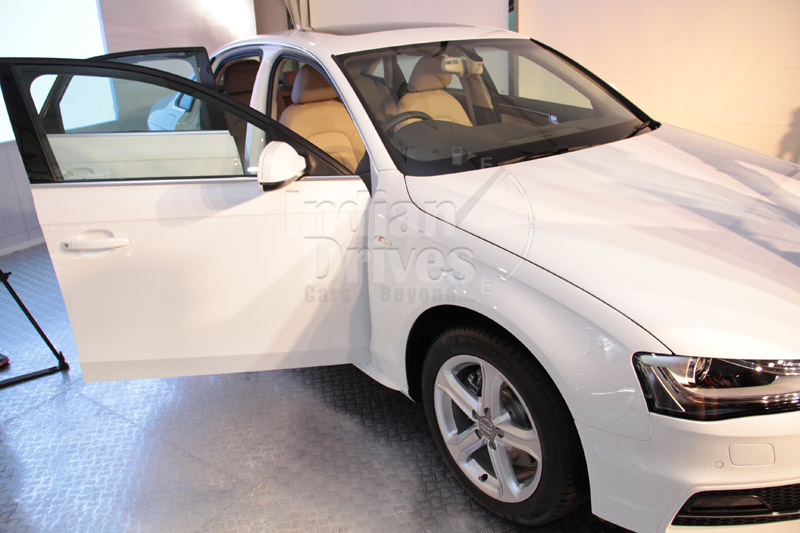 Our favorite is the most powerful diesel, the 3.0-litre TDI Quattro that features a 90 degree V6 cylinder configuration. This gives the Turbocharged diesel a stunning 245 bhp peak power and staggering 500 Nm peak torque. It beats all other models and stands amongst the quickest four-door sedans with a 0-100 kmph of under 5.3 seconds, while reaching speeds up to 250 kmph. Transmission options include the multitronic transmission for the 1.8 TFSI and 2L TDI, while the clever 7-speed S tronic does job for the 3L TDI. The S tronic transmission reduces the warm-up phase of the engine, improving the fuel-efficiency at idling. All the transmissions offer a wide spread gear ratios offering improved fuel-efficiency and dynamics. The top-of-the-range 3L TDI comes with permanent Quattro all-wheel-drive system. Despite the massive power, the new A4 features improved fuel-economy of up to 10 percent with the new Quattro design. As rated by the Automotive Research Association of India (ARAI), the 1.8 TFSI petrol delivers 15.64 kmpl, the 2L TDI diesel delivers 16.55 kmpl, while the most powerful diesel 3L TDI Quattro boasts 14.9 kmpl fuel-economy. The new Audi A4 is quicker and lighter than the forerunner. It is clever than the Mercs and Beemers with the Quattro technology that gives stunning power and spectacular fuel-efficiency. The figures speak for themselves but what excites us is that unlike most luxury cars, which are designed for the owner to take the back seat, the A4 is a more driver’s car. With elegant features, clever power and marvelous Quattro engineering, the A4 is a bargain over the brutal rivals, the Mercedes C-Class and BMW 3-Series.